sweet figs are seasonal fruits which are enjoyed by one and all. Figs are extremely juicy and sweet, and have a chewy flesh and crunchy seeds. Theyare eaten in both the raw and dry forms. 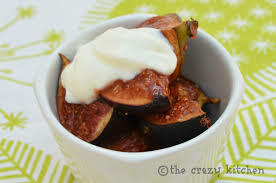 Fresh figs are more nutritious than dry figs, so try to include more of fresh figs in your diet than the dry ones. Before eating or using figs, wash them under running water and gently remove the stem. You can eat fresh figs whole or peeled. Simmer frozen figs in water to make them plumper and juicier.